How wonderful. 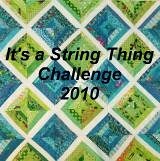 And what a sweet memory of your quilting buddy. A piece of her will remain with you. Oooo really love this quilt! Ooo really love this quilt! Very pretty. Are the white blocks also from white strings? Just beautiful! Yes Millie, the white blocks are strings. They are actually beige tone-on-tones. This looks much better in person. My camera doesnt take a very good pic. Thanks for all the lovely comments ladies. I really appreciate it. And special thanks to Stacey for starting this group. It certainly inspired me to get a lot of stashbusting done. Love stringing!! !